History: (Generation X Collector's Preview - Hembeck page) - Although many believe that any mutant can get into Xavier's School For Gifted Youngsters, at least five mutants were rejected by the school. Depresso was rejected because his ability to "bum out" others made him a liability to potential teammates; Leafmaster was accepted, only to be slain by the school's groundskeeper; Radial's power was only helpful in pursing villains who were headed downhill; Sneezing Louise got a thumbs down from the cafeteria workers; Sydewaze's powers were found to have no licensing value, because most mutant comic books were printed on their side already. Comments: Created by Fred Hembeck. Does anyone else recall the Xavier's School ever having a groundskeeper? Is that a codeword for Wolverine? At the time of this special, Generation X were the first actual students Xavier's School had taken in years since the New Mutants moved out. This wasn't meant to be set on Earth-616, but the humorous (in Leafmaster's case grimly humorous) nature of the characters and their histories is the only thing keeping it outside the regular continuity. These guys should have all joined S.P.A.F.O.N. (from the Year-in-Review features). Depresso was a mutant with the ability to bum out anyone within earshot. 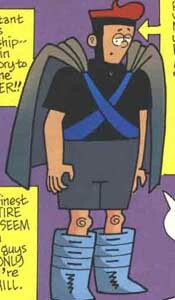 He was rejected by the school because his powers were a liability to his teammates, and it was thought that school spirit would suffer if he attended pep rallies. 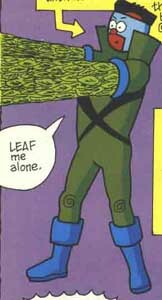 Leafmaster was a mutant with the ability to shoot leaves from his arms. He was accepted into Xavier's School, but was subsequently killed by their groundskeeper. 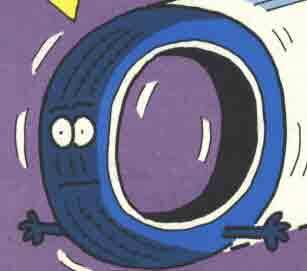 Radial was a mutant with the ability to transform himself into a steel belted tire. His application to the school was rejected because his power was only useful in pursuing villains who were fleeing downhill. Sneezing Louise was a mutant with prodigious nasal expulsion powers. She was rejected by Xavier's school because her powers were considered too disgusting, and because the cafeteria workers gave her a thumbs down. Sydewaze was a mutant with the ability to distort reality so that it appeared to tip on its side. His powers were thought to be useful at the school, until someone checked the comics on the school library and saw that most mutant comic books were printed on their side already, meaning his adventures would likely have no licensing value when they were chronicled.